The garden was one of the most exciting features of our house when we found it, and it is now proving to be a great playground. 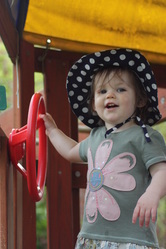 I think that since Amelia started walking, there have been almost no days where we have not been in the garden, and some days we have been out there all day. 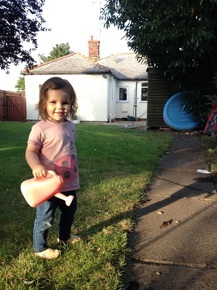 We were so lucky to find a house with such a big garden, and it is perfect for our supremely energetic toddler! We have slowly started to make it into a great space for her to learn and play. No garden seems complete without a mud kitchen... We built one out of an old table and two dog bowls. 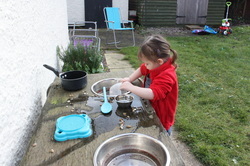 We may eventually add some extras, like a place to hang pans, some knobs, or some rings, but she has loved playing with it to collect water, mud or stones. The original mud kitchen did not survive two years of being soaked as we didn't varnish it... 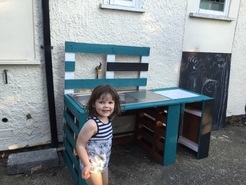 So we have made a new one out of pallets and a kitchen sink. It is not quite finished, but it is starting to take shape! The garden seems to fascinate her in different ways every day. Some days she is amazed by the flowers, others by the birds, or the insects we find. She loves it when I water the plants or try to pot anything. With the warmer weather over the summer, she had lots of fun in a paddling pool, but even more when we emptied it and created a huge puddle. She has learned to ride on her sit-on train and to push her trolley out here. 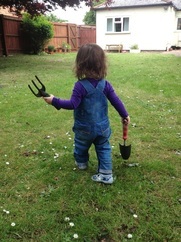 Next year, hopefully, we can learn a bit more about growing things together (if she stops unplanting everything I do...). 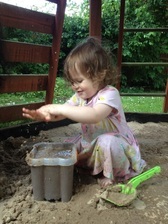 Most of all, the garden is a place where she can run around, laugh, get messy and have lots of fun. 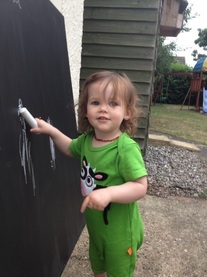 Our plans now are to create a sensory corner with different sound-making things and percussive objects, and maybe to make her a little flower and veg patch of her own. More to come in the future!